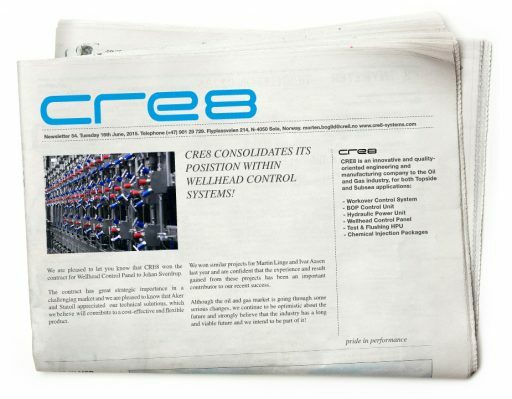 CRE8 consolidates its position within Wellhead Control Systems! We are pleased to let you know that CRE8 won the contract for Wellhead Control Panel to Johan Sverdrup. The contract has great strategic importance in a challenging market and we are pleased to know that Aker and Statoil appreciated our technical soluations, which we believe will contribute to a cost-effective and flexible product. We won similar Projects for Martin Linge and Ivar Aasen last year and are confident that the experience and result gained from these projects has been an important contributor to our recent success. Although the oil and gas market is going through some serious changes, we continue to be optimistic about the future and strongly believe that the industry has a long and viable future and we intend to be part of it!